Lightly grease the tin and line the base with non-stick baking parchment. Pre-heat the oven to 180C/350F/Gas 4. Measure the butter and sugar, mix till light and fluffy, add the eggs in small amounts and mix, then add flour, baking powder and beat the mixture till well incorporated. 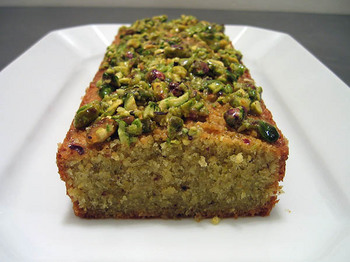 Then add the lemon zest and juice, pistachios and vanilla essence and mix well. Pour the mixture evenly in the prepared tin. Bake for about 25-30 minutes, until well risen and golden. The top of the cake should spring back when pressed lightly with a finger. Leave the cake to cool in the tin for a few minutes, then run a small palette knife or blunt knife around the edge of the tin to fee the sides of the cakes. Turn the cakes out on to a wire rack, peel off the paper and leave to cool completely. very easy to make the cake.